At Colorado Geothermal Drilling, we are dedicated to delivering the most energy efficient systems with professional and qualified design and installation services. CGD strives to do this by providing its clients with multiple services to fit their needs for efficient heating & cooling solutions. We have a great deal of experience in all aspects of design and installation of energy efficient geothermal systems and can answer any questions you may have. We can also assist a client's other contractors during any part of the planning process. We want to make sure our clients have the most energy efficient geothermal system to fit their needs. Colorado Geothermal Drilling operates a specially designed and customized drill mounted on a skid loader with tracks. Each piece of equipment has been tailored by CGD to meet our high quality standards and to fully maximize the efficiency of our operations. Because of this compact and efficient set-up, we are able to get into dense spots typically not accessible to other drilling companies, thus making geothermal a possibility for more people. 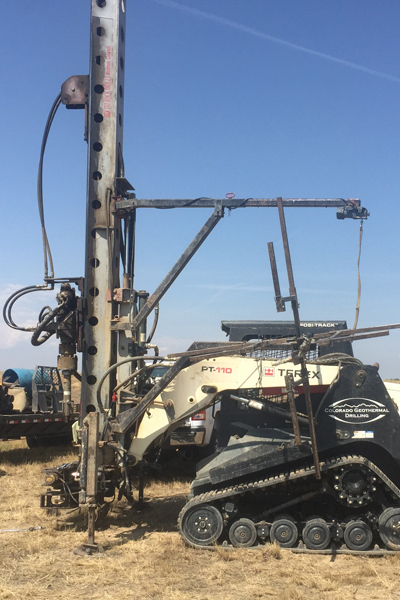 We specialize in providing vertical loop installations, typically drilling 200-400 foot wells. The number of wells to be drilled and loops installed is determined by performing a heat load calculation. This information provides the number of BTUs required to heat and cool the structure. After a heat load calculation is done, we can provide an economic analysis which shows the client how much they will save over the life of the system. For more information please contact Dan Rau or Kari Rau. Call us at 303.903.7081 or fill out a contact form. Colorado Geothermal Drilling is a member of the International Ground Source Heat Pump Association and licensed to install geothermal loop fields by the State of Colorado. Geothermal system installed by Dan in 2009. He helped prevent major installation problems by the HVAC company. My system has been flawless for more than 7 years now and he was less than 1/2 the cost of the second bid. You can't get any better. We have had a great experience both with Dan Rau and the system itself. Our house is all electric due to utility logistics and when we purchased it the heating and cooling system no longer worked. Dan and his crew drilled our holes and installed the pump units very efficiently and professionally. He recommended a heating and cooling contractor to run ducting, etc. who was also great to work with. We have had the system now for 4 years. It operates well and even in house with poor insulation our bills are very reasonable and the system is comfortable. I am also giving Colorado Geothermal a 6th star because a few months ago I noticed the pressure in the system had dropped and Dan came right out and found the problem, fixed it and left with no charge. Awesome. I was fortunate to find Dan Rau to install my loop for my geothermal system. He was knowledgeable, helpful, and efficient. If I have questions or issues, he is prompt in his response and service. Dan and his team were amazing! they did a great job and were very thorough both in the analysis and quoting process as well as the work they did an how they left the job site after the work was completed. As a Geothermal Drilling Consultant I have known Dan Rau since 2006 and have worked with him on numerous projects. In 2014 had him do the drilling on a new home my wife and I built. With my long term knowledge of Colorado Geothermal Drilling and other drilling companies I would not use anyone else. Dan has a consistent history of being competitive and a performance record that is unmatched in the Industry. Because Dan drills for over 50 HVAC contractors, he can either work with your HVAC contractor or recommend a experienced Geothermal HVAC contractor for the complete installation that will have maximum performance for the comfort of your home. Colorado Geothermal Drilling did a fabulous job doing the underground drilling for our new geothermal system. They were quick, efficient and professional. Dan was very knowledgeable and helped us understand the whole process. We have had our system installed for almost a year now and are very impressed with it! We highly recommend this company if you are thinking about installing a geothermal system. We are so happy with the geothermal in our new house. It is one of our favorite things! Colorado Geothermal drilling are fantastic people! Seriously cheap heating and a bonus cooling in the summer! Our heat bill in winter was about $60 in the coldest month for 3,000 sq feet! Not even joking! A cool 70 degrees all summer is costing us $25/ month! On top of that it's not a dry heat, there's the perfect amount of humidity in the air! Unlike typical forced air. It's almost unbelievable. Best decision we've ever made! !